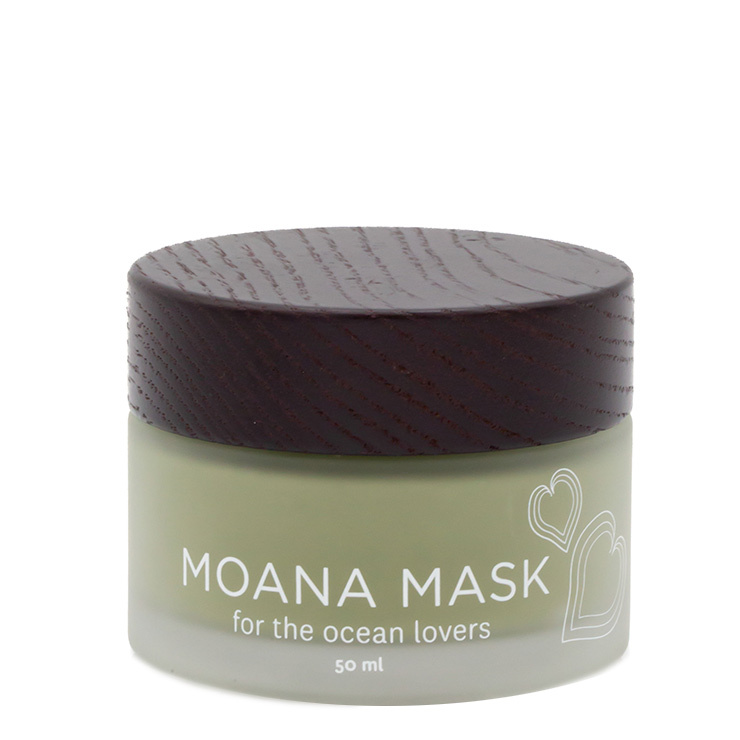 Transport your senses to the tropics while visibly restoring skin to health with Honua Hawaiian Skincare Moana Mask. 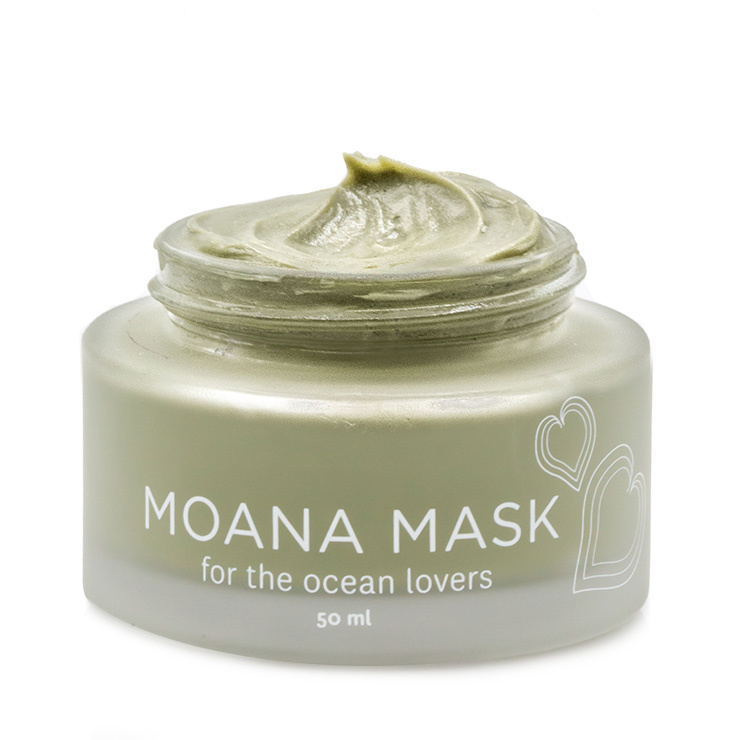 Moana, the Hawaiian word for ocean, draws on benefits from the sea to give skin the appearance of revitalization. Limu Ko’a lends a feeling of detoxification and regeneration to skin, creating a youthful look. Laukahi, a plant used for centuries in traditional medicine, is used to make skin feel supported and balanced. Aloe vera makes skin feel soothed and comfortable, while macadamia nut oil gives a feeling of nourishment and hydration to parched skin. Ideal for use after spending time in the sun or when skin is feeling dry or stressed. Smooth onto face and neck and allow detoxifying face mask to remain on skin for 15-20 minutes. Rinse with warm water. Use 2 to 3 times weekly for a look of fresh, hydrated, glowing skin. Hawaiian Honey, +French Green Clay (Montmorillonite), +Kaolin Clay(Kaolinite), +Bentonite Clay, (Montmorillonite), Hawaiian Spirulina (Arthrospira Platensis)*, +Laukahi (Plantago Major), Lau Comfrey (Symphytum Officinalis)*, Licorice Root (Glycyrrhiza Glabra)*, Olena(Curcumalonga)*, Aloe Vera Leaf(Aloe Barbadensis)*, Witch Hazel Leaf (Hamamelis Virginiana)*, +Hawaiian Sandalwood Hydrosol(Aqua),(Santalum Paniculatum), Neroli Hydrosol(Aqua)*, (Citrus Aurantium Amara), Bulgarian Rose Hydrosol (Aqua)*, (Rosa Damascena), Tamanu (Calophyllum Inophyllum), +Macadamia Nut Oil, (Macadamia Ternafolia), Coconut Vegetable Glycerin , Wheat Germ Oil (Triticum Vulgare)*, Willow Bark (Salix Alba)*, Jasmine CO2 (Jasminum Grandiflorum)*, Essential Oils Of Neroli (Citrus Aurantium Amara)*, Loke/Rose (Rosa Damascena)*, +Petitgrain (Citrus Aurantium), Red Mandarin (Citrus Reticulata)*; Sweet Orange (Citrus Sinensis)*, Antioxidants Of +Sage(Salvia Officinalis); Rosemary (Rosmarinus Officinalis)*. This mask blew me out of the water (pun intended;) and kicked my top shelf, HG mask to the side. My skin looks calmer and even toned afterwards and my pores are smaller. I also used this as a cleanser while vacationing in Florida. Worked great! Leaves my skin looking dewy, and the scent is like aromatherapy while I'm wearing it--so relaxing. A real delight. this is a great discovery. i have sensitive skin but its also prone to clogged pores. honey masks usually take care of both problems and this is no exception. does a great job, smells incredible and the best part is its 1/2 the price of the other masks ive been using but just as effective. will definetly purchase again. It happened again, and always does with Honua. I really like these products. They are effective, calming skin food. When I got this mask in the BH box and tested it out for the first time, I saw my husband leaning over to see what I had. When he saw it was Honua (he simply can no longer live without the Olena oil), he sheepishly slid it to his side of the counter and gave it a try. Now he is masking twice a week and the jar stays on his side of the counter. I can tell that this will be a definite re-order. My skin is dry. His is oily. It works nicely for both, clearing out pores and leaving our skin moisturized. Honua knocks it out of the park again. This mask is fantastic. I have sensitive 53 year old fair skin and no had nommproblems with this product. The price is great. The scent makes me happy and want to keep smelling it. It works and my skin feels so smooth and fresh after. This mask has surpassed my prior favorite mask from another box. Honua is an excellent brand and I really look forward to trying new products.